Of all the trees in New York City, none are quite as iconic as the one at Rockefeller Center. Lighting this enormous tree is a near-century-old tradition that brings Manhattan Islanders together for the holiday season. While you can easily attend the lighting ceremony from the Wall Street apartments for rent, we’ll bet you didn’t know these 10 surprising facts about the tree itself. The first ceremony to unveil a tree at Rockefeller Center was held on Christmas Eve of 1931. It was only 20 feet tall at the time, which is a mere quarter the size of today’s tree. The tree was meant to bring a little hope into the dark times of America’s depression. Whether it worked or not is debatable, but the construction workers hired to erect the tree found the holiday spirit in the form of a rare payday in the early 30’s. Given the Great Depression’s shadow cast over 1931, the original tree was adorned with scrap paper and tin cans. As New York rebounded, so did the appearance of the tree. Colored lights and ornaments debuted in 1934, while a four-foot plastic star was added in the 50’s. As the years went on, the Rockefeller Center Christmas Tree became an illuminated beacon in Manhattan. By the 1990’s, the tree was using gold decorations and fanciful trimmings. In 2009, 78 years after the original debut, Rockefeller’s tree reached a high-class status with a 550-pound star made from 25,000 crystals and one million facets. Known as the Swarovski star, it cost an estimated 1.5 million dollars to create. In the early 1940’s, Rockefeller Center utilized three Christmas trees to show New York’s support for America’s efforts in World War II (one red, one white, one blue). Now more illuminated than ever since the depression of the 30’s, New York residents loved their nighttime glow. Sticking with blackout regulations in coastal regions during the war, the trees remained unlit in 1944. However, the city made up for this depressing necessity with six ultra-violet light projectors and 700 fluorescent globes in 1945 to make the brightest tree in Rockefeller’s history. You might not remember a time when the lighting ceremony wasn’t broadcasted onto every television in the country, but that simply wasn’t the case prior to 1951 when the tree first appeared on The Kate Smith Show. It later became a holiday special on the Howdy Doody Show until 1955. News channels like picked up the special afterward. Today, you can live stream the event on numerous YouTube channels. On some occasions, Rockefeller Center’s tree is donated by a kind individual. Most of the time, however, the city hunts down the perfect specimen. The late David Murbach, the center’s garden manager for decades, used to take scenic trips through New England in a rental car to find the best tree possible. Today, the center employs the use of helicopters to make the task easier. On any given year, the tree at Rockefeller serves as a scenic backdrop and nightlight in the area. In 1979, however, one determined man turned it into a political protest. He climbed to the top of the tree as he shouted for officials to release 50 Americans being detained at the U.S. embassy in Iran. He finally climbed down after speaking with city police, who pointed out that climbing the tree wouldn’t free the hostages. Did you know that the tree travels into the city at night? It makes sense when you think about it. Traffic can be a nightmare, and an enormous tree flowing through the bustling city streets would only add to the ever-present traffic jams. Most of the decorations are places on the tree before it is raised, and it never needs to be watered. Thanks to outside winter conditions, it never dries out as fast as the one in your home might. The modern Rockefeller tree is never shorter than 65 feet tall, thanks in part to the sheer size of the Norway Spruce (New York’s choice since 1982). The tallest tree to ever stand in the center was an astonishing 100 feet tall. It came from Killingworth, Connecticut, and broke the record in 1999. Due to maneuvering limitations in the city streets, no tree has ever beaten the Killingworth record. Since the 60’s and 70’s, Rockefeller’s tree has done its part to stay as green as possible. Nature trails in upper Manhattan received much-needed mulch from the recycled tree of 1971, while Habitat for Humanity used the 2005 tree’s wood for door frames. The center has used energy-saving LED lights since 2007, saving around 1,200 kilowatt hours of electricity each day. 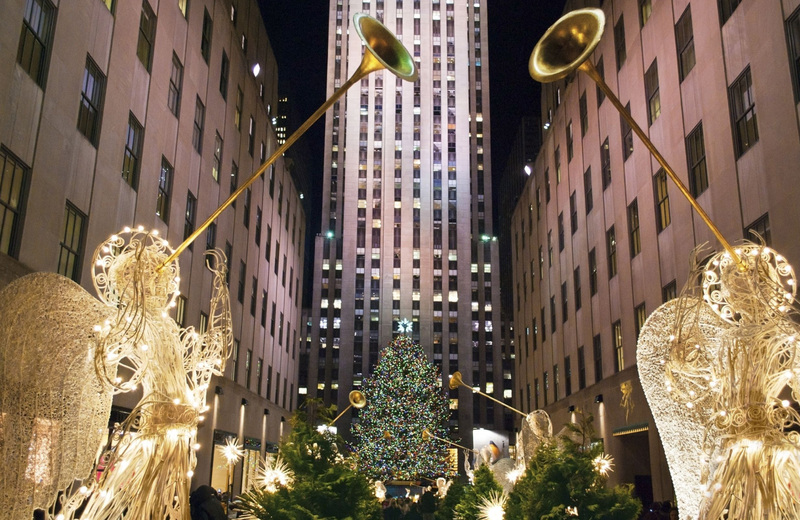 If you or someone you know as a photogenic tree that can compete with the 75+ foot ones used at Rockefeller Center, then you can submit that tree and ask the center to use it. It was only a few years ago that a resident of Gardiner, NY’s tree was chosen. Thanks to New York City’s excellent public transportation, the tree at Rockefeller Center is just a short trip away from your home at 15 Cliff. With a carefully curated selection of luxury amenities and a convenient downtown Financial District location, these apartment homes offer a refined sense of high-end living in Manhattan. Spacious layouts, top-tier finishes, and community spaces create an envious home. Meanwhile, close proximity to the area’s dynamic mix of top-notch restaurants, world-class entertainment, and premier shopping experiences await you. The community within the building is crafted from exceptional services and shared amenities that cater to every facet of life. Stunning views from the landscaped roof deck, a fitness center, and resident lounge are just the tip of the iceberg. Features like on-site maintenance and a CitiBike docking station make life easier, while pet-friendly accommodations ensure every guest is satisfied. Thoughtfully designed to maximize comfort and convenience without comprising elegance, this apartment community redefines luxury living in the city. Welcome to a new era of downtown living in FiDi. Welcome to 15 Cliff.